All over the world, nations are facing challenges about how best to meet the increasing demand for energy. Further understanding of how our climate is affected by the burning of fossil hydrocarbon fuel – which contributes to climate change and ocean acidification – plus rising costs, worries about risks of oil spills and concerns over the security of energy supply from unstable or potentially hostile neighbours has led to the development of a range of new, sustainable, energy production technologies. In fact, many countries around the world have now set firm targets for the proportion of energy that they must deliver from renewable sources. Renewable energy devices extract power from the Sun, from biomass, or from natural forces such as wind, river flow, waves and the tides. Apart from the long-established technology of hydro-electric power through the use of dams, the most developed resource at present is wind energy, as the technology is fairly mature and the required devices are relatively simple to build and straightforward to install. However public concern over the visual impact of wind turbines and the need to place them in locations where they can be large and exposed to the most consistent wind, has encouraged engineers to focus on offshore locations. Today’s offshore windfarms tend to be in shallow coastal waters and they have monopile foundations, i.e. a single wide diameter tube that is usually driven into the seabed. In deeper water, further from the coast, the costs of installing this type of foundation increase considerably, but a new generation of floating windfarms, moored in optimum locations, is starting to be developed. Subsea technologists, engineers and scientists work together to design the installations, to understand how best to place power cables, how to take into account the conditions on the seabed, and how to avoid causing harm to marine life during the construction and operation of the windfarms. Consideration is being given to co-location of aquaculture of fish, kelp or shellfish at some windfarm sites to make best use of the infrastructure. Marine planners are an important part of the offshore renewable energy industry, as windfarms or other installations have to take into account the needs of other marine industries and users such as fishing, shipping, aggregate extraction, tourism and defence. In the UK, sites for offshore wind are leased by the Crown Estate (the ‘landlords’ of the seabed around the UK) and planning approval is given by the Marine Management Organisation. The potential for offshore wind to meet the electricity demands of some nations is very large – Scotland for example expects to be able to generate at least 80% of its electrical power from renewable sources (mainly wind and hydro-electricity) by 2020. 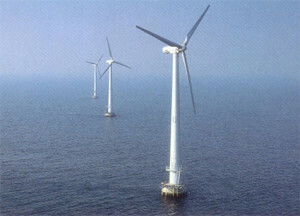 While offshore wind energy is already well established, other technologies are becoming available. Efforts to generate electricity from waves and tides have taken place for decades. Waves on water are created when the wind at the surface transfers its energy over long distances. We are all aware of the tremendous energy within waves when we witness their destructive power during storms. In recent years many different designs of wave energy converters have been designed and tested. They need of course to be of robust design to enable them to survive storm events. Some are designed to operate on the coast itself whilst others are intended for placement further offshore. 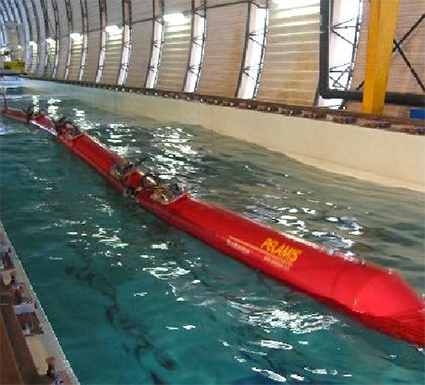 One such device that extracts energy from the waves offshore, known as ‘Pelamis’, has been successfully deployed off the UK and Portuguese coasts in trial installations and other concepts are under development. One side effect of wave energy devices is that by extracting energy from the waves, the water on the other side of the device can be calmer. This can be useful for coastal engineers who look at ways of protecting the coastline from erosion or storm damage. 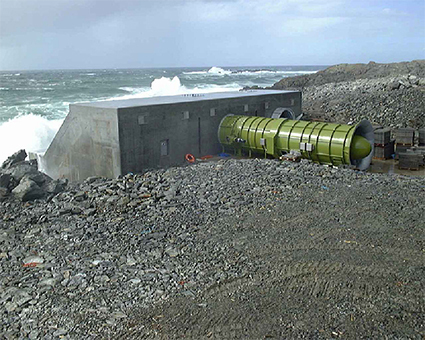 With good planning, wave power systems could be carefully placed in areas that have vulnerable coasts, helping to protect them from extreme weather. In the future, wave energy devices are expected to play a role in generating power, but they do have some limitations. One is, of course, that those installed offshore may limit freedom of navigation for ships; another is that like wind, the occurrence of waves with the required height to generate useful energy is unpredictable. Avoiding these limitations, are devices that extract the energy from the tidal stream (or flow). The tides, and the resulting tidal streams, are a result of gravitational interaction with the Sun and the Moon and as such can be reliably predicted decades in advance. Hence tidal energy systems have an important advantage that, subject to reliability, their power outputs will be entirely predictable. 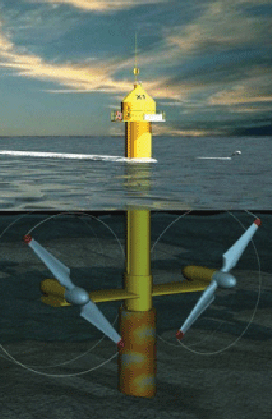 Tidal energy systems fall into two types: barrages, which capture water at high tide, and machines that can be placed directly on the seabed to extract energy from tidal streams. The barrage type tidal power station on the Rance estuary in Brittany, France has developed electricity since the 1960’s using essentially similar technology to that found in dams. A much more ambitious scheme, that alone could supply a significant percentage of the UK’s electricity, has been considered for many years. This involves the building of an enormous barrage across the Severn Estuary to take advantage of one of the largest tidal ranges in the world. An alternative system, using a lagoon instead of a barrage, has been put forward for Swansea Bay. A number of machines have been developed for extracting the energy from tidal streams. Often resembling a wind turbine, but with much smaller diameter blades because of the much higher density of water, they can be installed on the seabed allowing small ships to pass freely overhead. 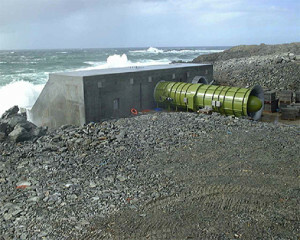 Some designs penetrate the surface to allow for easier maintenance, such as the trial installation of SeaGen in Northern Ireland which harnessed flow in Strangford Lough using a 1.2 megawatt turbine. Before this turbine could be installed, detailed research took place about the behaviour and feeding habits of seals in the area to ensure that they would not be injured by the turbine blades. Robust seabed tidal power generators are now being developed by several major companies and their deployment is expected to begin at a number of locations around the world. Because their energy production varies with the tides, these sorts of system work best in conjunction with a means of energy storage, such as ‘pumped storage’, that enables the energy to be used at times of peak demand. It is likely that arrays of different technologies will be deployed alongside one another, each contributing to the overall supply of energy. If society starts demanding hydrogen as fuel for cars and aircraft in the future, these seabed systems are well placed to electrolyse seawater in situ to produce abundant quantities of fuel for the supply network. Offshore renewable energy is here to stay. Wind is just the first of a whole variety of different technologies that will work together to meet the demand for clean, safe, renewable energy, at locations large and small in coasts and deep waters all over the world. All of the devices will require experts who are able to survey optimum locations, ensure environmental protection needs are met, then deploy, operate and maintain the generators over many years of operation. It’s an exciting and worthwhile career option – helping to provide the power we all need, with minimal adverse impact on the planet. Copyright © 2019 Society for Underwater Technology. All Rights Reserved.